Well, hello, and thanks for visiting today! It's time for a fun new challenge at Really Reasonable Ribbon, and this time our theme is Anything Goes. That means you can link up ANY project that includes ribbon, lace, twine, or some sort of spooled trim. We always enjoy seeing your creativity, and every card is better with ribbon. So, why not come play along? 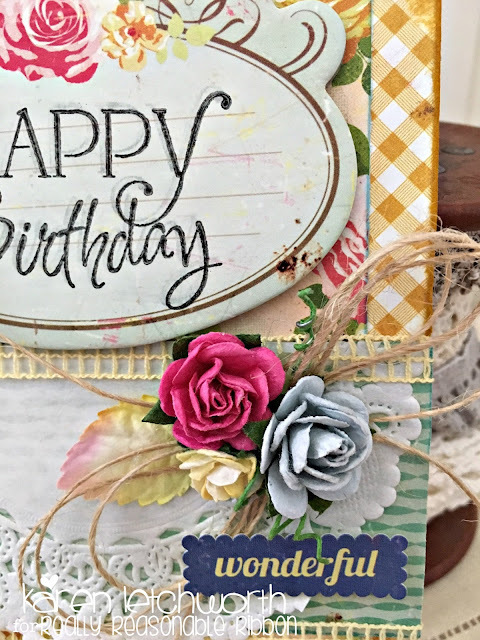 For this fun new Anything Goes Challenge, I chose to create a sweet card using some Crate Paper products (some of my faves), and of course.....LOTS of great Really Reasonable Ribbon goodies to adorn it! Once I inked and placed my patterned papers, I stamped a Happy Birthday sentiment on a coordinating piece of chipboard. Next, I added half of a white paper doily, and because Really Reasonable Ribbon has SO MANY FABULOUS Mulberry Flowers, I knew I could find the perfect colors to match my card. I added one Two-Toned Yellow Open End Rose, one Deep Pink Open End Rose, and one Baby Blue Open End Rose. I love the sweet little stems on these fabulous Mulberry Flowers, and I enjoy twirling the ends. I also tucked in a Green/White Mulberry Leaf under the flowers, and a long length of wrapped Natural Burlap String. All these fabulous layers of paper, doilies and ribbon are securely held in place with a wonderful Adhesive called Scor-Tape. Thanks so much for stopping by today. I really do hope that you will play along in this fun new Anything Goes Challenge at Really Reasonable Ribbon. Have a great week, and happy ribbony crafting! Simon Says Stamp Wednesday Challenge - Summer Sunshine - I used sunshine yellow paper, and of course....flowers need sunshine to grow! 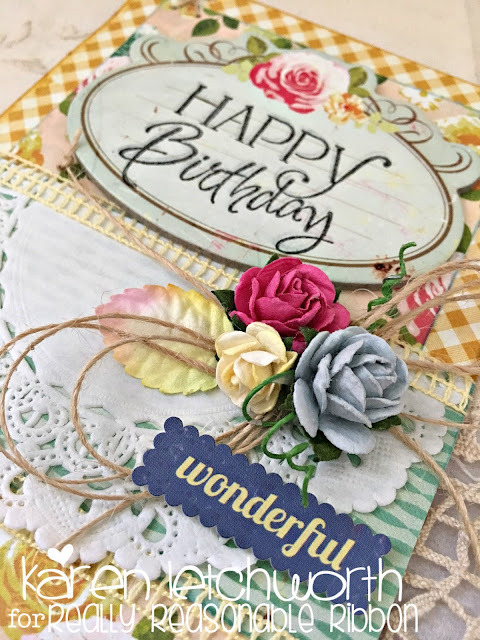 Southern Girls Challenge Blog - Challenge #163 - Ribbon or Twine - I can't hardly make a card without trim. I used a yellow mesh ribbon and some natural burlap string on this card. 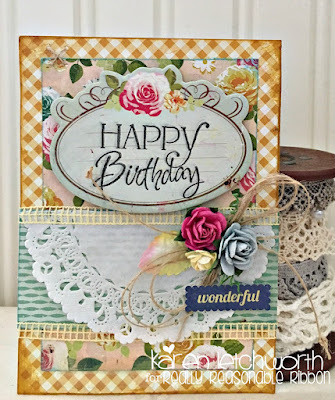 Mod Squad Challenge Blog - Mark It, Stamp It - This challenge is SO perfect for this card. If you look carefully at the close-up photos of my stamped image, you will see where I marked it (with my marker) the first time...and it stamped SO faintly.....and then, I marked it again (with a better marker), and it stamped beautifully. But you can see both attempts if you look closely. Tic Tac Toe Challenge - #005 - My tic tac toe is diagonally to include Ribbon, Die-Cut, Birthday, and across to include Birthday, Patterned Paper, and Pink. I love everything about your beautiful creation -- the colors, the doily, the roses, and all the wonderful layers! You're a master at creating lovely things! Karen, your card is gorgeous. Love those flowers and the twine together. This is beautiful, Karen. Really lovely details! This is just beautiful Karen and such a lovely design! Thanks so much for joining in the fun at our Double D ‘Pastels’ challenge! We hope you’ll come back often. Stunning! Your card is just beautiful! Thanks for joining us at PIP Challenges! Such a lovely card with all the detail. I loved how you have Tic Tac Toe double. Thank you so much for joining us this week over on the Tic Tac Toe challenge. GORGEOUS! I love all of your beautiful layers and Designer Papers, soooo pretty! All of your accents are perfect, flowers, twine, doily and that lacey ribbon! Fabulous! Thanks so much for playing along with us again at The Double D Challenge Blog, Pastel Party. Donna, DT Member. Karen, your card is stunning! Beautiful colors and I love the way you brought your flower bundle in! This is lovely, Karen! You do so well mixing papers and colors, and your embellishments are spot on. I really like the open weave ribbon around the center of the card! Such a beautiful card as always - love the layout thanks for sharing!!! Lovely retro-looking card,Karen!Very unique!Thank you for sharing! So very pretty. Thanks for joining us at Southern Girls Challenge this time around. Karen, this is such a lovely card. Doilies and ribbons and flowers, oh my! Thank you for sharing your beautiful card with us at Tic Tac Toe Challenges! HI Karen - love all the layers and dimension you put into this design! It's so pretty and I am so happy you shared your talent with us at Tic Tac Toe Challenge! Oh my, what a lovely creation! I love the vintage-y look with all those beautiful flowers. And yes, I can see the faint image of the first time you stamped. Thanks so much for playing along with us this week over at the Mod Squad. Karen, your card is gorgeous! The layers, the flowers and the patterned papers you use on it are perfect together. Thank you for playing along with Joy Clair July Challenge. Hope you will play again with us in August!